This list of trivia about your stool is the sh*t! Aside from a spot of toilet humor here and there, nobody really talks about their poo, do they? It's not the most ladylike thing to blurt out over any kind of table, never mind whether it's got dinner on it or not. Despite years of convincing men women only go for one poo once a year, on Christmas Day (when else? ), we all know that's just not true. So without you having to talk about it *god forbid* out loud, here's some information your doctor wants you to know about those bowel movements of yours, from the medical experts at continence and ostomy specialist, Coloplast. 1. Your water consumption really affects your poo. A healthy digestive system is a hydrated digestive system, as the saying goes (does it?) So make sure you keep your water consumption up. When you don't drink enough water your poop becomes drier and harder to pass, so make your water bottle your best friend and try to always have one by your desk. 2. For the love of GOD (and your bowels), don't skip meals. Eating regularly keeps everything moving, so if you don't eat often enough then it's very easy for your body to become blocked up. Eat healthy food (within reason, ain't nobody gonna say no to cheesy pasta) in small amounts frequently throughout the day, and try to stick to the same eating pattern if you want to go like clockwork. 3. And don't hold it in, either. We've all been there, wriggling around like some kind of ADHD caterpillar trying to hold it in until you can reach the throne of dreams (the toilet). But if this at all avoidable, then avoid it. If you need to take a trip to the banyo, go. Holding in your poo isn't good for your insides, so make sure you go when nature calls. 4. A healthy poo should look like a smooth sausage. The perfect poo! An A+ poo! Apologies to anyone who doesn't have a strong stomach, you'll probably never touch sausages again. But seriously, that's what you need to aim for. This type of stool means your bowels are in good shape (literally) and getting everything they need. And don't beat yourself up, you know. If your poop has a few cracks in it, that's still completely normal. 5. Dry and lumpy poop? It means you're a bit clogged up. Constipation is no biggie, it's actually really common and tends to get moving sooner or later. But if you are suffering with a "no go zone" situation, make sure you up the fibre in your diet (dried fruit is a good shout), or try having a cup of ginger tea; that should get things going. 6. Does your poo feel a bit hard? Obviously you're not actually touching your own poop (we hope not, anyway) but you should get some idea if it feels hard when you go. If this is the case, your body's telling you it wants more fibre. So get yourself fresh fruit and veg. Leafy greens such as spinach are also good source of fibre. See? Not just useful for Popeye and his guns. 7. 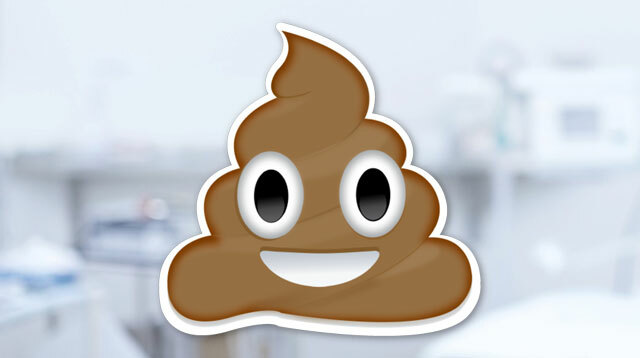 Black poop = bad. If your poo is black and tar-like in consistency, you should visit a doctor. Don't panic immediately, but it needs checking out because a black stool could be a sign that there is blood in your bowels, and if that's the case then it could be quite serious. So for peace of mind, go visit your GP and get checked out. 8. Runny poo means you're sick. You may have eaten something your tummy doesn't agree with, or perhaps you caught a bug—either way, diarrhea means your body is naaaaht happy. When you have diarrhea it's important to drink lots of water, as it can be dehydrating. If it continues for more than two days, head on down to your docs and see what they can do. 9. Alcohol can really affect your poo. This might not be news to you; I mean, we've all heard of "The Alcopoop," haven't we? But if you've ever been drinking on a night out and found you suddenly need to suddenly take a trip to the banyo, it's because alcohol can act like a laxative and actually speeds up your digestion. Coffee has the same effect. And when you've gotta go, you've gotta go. 10. Don't worry too much about how frequently you go. One person's normal bowel movements might not be the same as another's, so don't worry if you're not pooping on the daily. Some people go three times a day, some only three times a week. But it's important to keep in mind how regularly you tend to go, so you notice when something changes. And remember...don't be afraid to speak up. A recent study found that one in five people would be too embarrassed to speak to their doctor about their bowel health, but there's really no need to be.